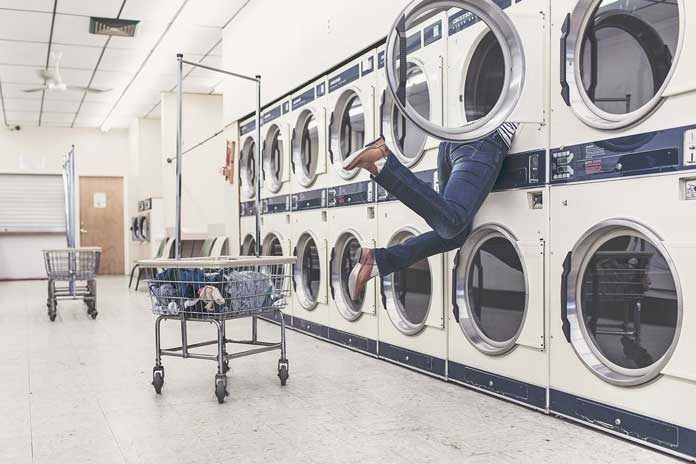 Laundry is one of the most important and time-consuming chores in the home. Whether we like it or not, we end up spending a lot of time in the laundry room. However, this room has the tendency to get disorganized and messy over time. It easily gets piled up with clothes, washing products, and lots of useless stuff. Who would like to do laundry in such a cluttered place? If your laundry room is disordered as well and you are looking for ideas to spruce it up, we have some awesome tips for you. Keep reading! Start by decluttering your room! Don’t turn your laundry room into a store. Take out all the junk scattered there. Keep the stuff that actually belongs in this room, and that would be required. Neatly organize everything in the room, keeping all the detergent bottles and laundry supplies hidden in cabinets. Never put them on open shelves as they would give a very messy look. Put away clean clothes as soon as they are dry to avoid loading the room with clothes. Make most out of the space that you have. Try to utilize every inch of the room. If you want to function efficiently in your laundry room, divide it into zones and designate the space for each task. The most important things are your washing machine and dryer. Get them fixed in a nice spot. Fix your laundry supplies storage nearby so that you can easily grab whichever bottle is required while doing laundry. Sort your supplies such as detergents, stain removers, bleach, and fabric softeners, according to their type. Even if you own a dryer, you still need a place to dry clothes. You can use a rack, a retractable clothesline, or a rod for this purpose. To save space, opt for a folding rack or place hooks in the vertical space to drip dry your clothes. If your room is big enough, create an ironing station there as well. Ideally, your iron, ironing board, spray bottle and other ironing supplies should be kept out of the way and sight when not in use. So either keep these things in a closet in the room or hang your ironing board on a less used wall. The best way to sort out all the laundry supplies is by using shelves, cabinets, or baskets. Hang them above your washer and dryer or on a wall near to them. You can also make use of rolling laundry carts or door organizers. Choose shelves with hooks and rods for extra hanging space. Using these organizers would give you enough space for miscellaneous items such as towels, or sewing kit or anything else that you would like to keep in your laundry room. Moreover, pre-sorting the laundry would make things way easier for you. Use three laundry baskets instead of one, to separate the white, light colored, and dark colored clothes. So that, whenever a basket gets full, you can run the wash. Don’t forget to add a basket for lost and found items! Lastly, work on making your laundry room welcoming and beautiful. Make it pretty to enjoy the time you spend there. Use cool and calm colors so that your room looks more organized. Add patterned curtains and a bright, cheerful rug to enliven the space. If you have space, don’t forget to add some wall art or pictures to give it a warm vibe. Placing a fresh plant in a corner would certainly make the room more appealing. Good lighting makes everything look better, so that’s a must! This post was written by Sadia Suhail. She loves interior decor, home décor and art & craft.